Greetings from Helsinki! I have just returned from my annual autumn season in Nepal! I first led Aventura Tour Operator’s trip on Annapurna Circuit which I might say is my favorite trek in Nepal. We were again blessed with excellent weather throughout the whole trip! 1) It is crucial to time the treks right! It has become a norm that as Bay of Bengal warms up, it brings cyclones in Nepal in mid-October. We do our Annapurna Circuit starting in late-Sep which seems to be good time for the trek weather-wise. 2) Many of the victims were independent trekkers and did not know there was weather coming in. This also is a reminder that Nepal is a poor country and they do not have established meteorological capabilities neither do these regions have a sound network to announce warnings. More so many of the trekkers apparently were not aware that if you suddenly get a meter of snow in mountainous region, it might not be favorable for safe trekking. For many groups it might have been beneficial having a professional guide leading the trip. Anyway, our Annapurna Basecamp trek was safe and successful and we got to enjoy the Himalayas with an amazing group of people in fairly good weather. 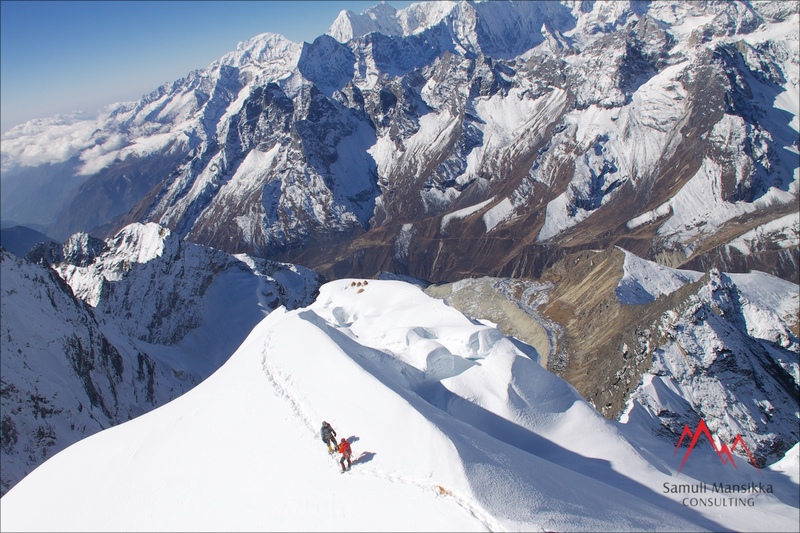 Our big climb of the year was Altitude Junkies’ expedition on Cholatse! In fact, I first wanted to climb this peak in 2005 but after Ama Dablam decided to travel to Thailand instead! Ama Dablam has become an amazingly popular mountain since (well, it was even back then) and we were looking for a more quiet peak which would offer us similar technical climbing in stunning setting. We indeed were the only team on the mountain and thus got amazingly pristine feel on the whole trip. During our climb we were forced to receive transmissions from Ama Dablam which made us feel good about our selected peak. Ama Dablam had a bad season with several severe accidents and I think many of them were due to it being so overcrowded and the fixed ropes getting too much wear. Cholatse proved to be quite a climb! The SW-ridge was far more exposed than anticipated and the climb a lot longer in all. Our group did excellent on the route following what our staff (who did amazing job) had fixed. From our Camp 2 (6200m.) we climbed alpine style on some of the most exposed ridges I have ever climbed not to mention guided. Thanks to good weather (and professional weather FX’s) we summited a full week early after which we helicoptered out direct from basecamp. Find Phil’s dispatches here! I have just added fresh pics (with captions) on our Facebook page so please enjoy browsing through! My next trip is on Aconcagua starting right after Christmas! That is through Finnish Aventura Tour Operator (vielä ehdit mukaan!). I will be traveling there from Australia where I will be enjoying my annual portion of tropical beaches! Please follow my travels through Instagram! That is it for now! Best wishes to everyone!